Cafeland : Design your cafe world and join cooking with one of the best restaurant games! Write your own restaurant story in Cafeland today, Chef! Master your cooking and design your 5 star cafe to be the top chef in the world! Run your own restaurant and get carried away in a cooking fever! Home cooked meals and fresh coffee are waiting for the customers. Just say “I’ll decorate my cafe and I’ll also add a lovely garden!” and your cafe will thrive! FROM A SNACK BAR TO A WORLD FAMOUS CAFE! Serve dishes from different cuisines. Cook on multiple stoves and serve a variety of meals. Unlock new recipes and grow your menu. Fill your counters with plates of yummy dishes to please your customers. Choose from a variety of food categories. Make the best burger in chef town. Spread the dough for a crispy pizza. Bake a moist chocolate cake. Bake, boil, fry or saute; every dish will come out as perfect! Choose from hundreds of fancy decorations. Build special items to boost your income. Cover your walls and the floor with only one click! Entertain VIPs at a celebrity lounge. Become the owner of luxury dining. Design and decorate a world famous cafe! Invite celebrities to your place from all around the world. Prepare your cafe to host them. Get good remarks and win mystery gifts! Race against time to prepare catering orders. Fill catering boxes with different categories of food. Deliver gourmet meals for special customers. Get help from your friends! Earn money and great prizes for finishing catering orders! Become the master of this cafe world! Listen to your customers and find out about the good and the bad. Expand to have more room! Decorate to your heart’s desire! And make it fun for everyone! Visit your friends and help them out. Send mystery gifts to each other. Ask for help in your catering business. Join the community and meet new chefs! Meet the Cafeland crew and let them guide you along the way. Complete the tasks hand in hand with Eva! Let Katie help you out with supervisor tasks. Ask for Chris when there is an item to build. Join Grandpa Tony in trying out his new recipes! This is the BEST cafe building game out there! You can earn your coins and bucks easily so you can expand and keep up with the game! And if you do spend real money, its not much and its totally worth it! Hi there! We honestly think that, a little challenge spice things up and adds to the fun! However we understand that you may have a different opinion on this matter. Please contact us through the game because we consider your feedback as a helpful source to adjust the balance in the game. Thank you very much! 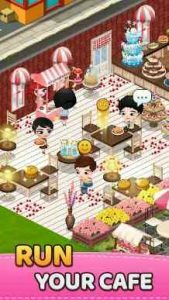 This game is based on you having your own little coffee shop it’s really fun you could visit other peoples shop and see how there shop is you could make our shop bigger so get this game. Very relaxing. The tasks are challenging, but achievable. And if you join a league you can get help from your teammates and you get lots of rewards during tournaments.